If you work out and suffer from soreness and muscle fatigue, this is the massage for you. If you suffer from chronic pain or lack of mobility due to injury, this is your best choice. I have been practicing massage therapy for over 20 years, 7 of which I have worked with a chiropractor. Through combining my massage and personal training knowledge, I’ve gained an incredible understanding of the body and its needs. Not only will you get an amazing massage but I will provide a true Zen experience like no spa can. Let me ask you this. Aren’t you tired of paying $85+ tip for a mediocre massage at a high end salon? Or, better yet, tired of requesting a deep tissue massage that is actually a Swedish massage with minimal hands on pressure? Well, I’ve got good news for you! I’m the real deal when it comes to providing a thorough deep tissue massage in a relaxing stress-free environment. Don’t book another massage at a salon where the massage therapist has overbooked themselves and has to cut your massage at the 55 minute mark. I believe in allotting ample time between massage appointments in order to serve you better. You’ll never have to leave disappointed again! 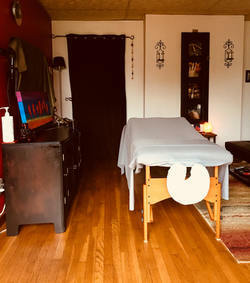 My location is convenient, my price is fair, and my massage experience along with my strength will certainly “Get to the Point” where your body needs it most. Call for an appointment today and decide for yourself. It’s your money—get what you pay for!